The band has been described as indie rock, art rock, dance-rock, and baroque pop. They play guitar, drums, bass guitar, piano, violin, viola, cello, double bass, xylophone, glockenspiel, keyboard, synthesizer, French horn, accordion, harp, mandolin and hurdy-gurdy, and take most of these instruments on tour; the multi-instrumentalist band members switch duties throughout shows. Win Butler and Josh Deu founded Arcade Fire in Montreal around 2001, having first met at Phillips Exeter Academy as high school students. Butler and Deu's musical ideas began to develop and the first incarnation of the band was born while they were attending McGill University and Concordia University, respectively. The duo began rehearsing their material at McGill where they met Régine Chassagne, a music student whom they asked to join them. Deu recalls, "Win and I played guitar. Everyone played guitar. We had no music to show her, but she ended up saying yes to joining us, and I don’t know why. Maybe there was a little spark with Win." The trio recorded a set of demos and began performing live in the second half of 2001. At that time, the band consisted of Butler, Chassagne, Deu, multi-instrumentalist Tim Kyle (later of Wild Light), bassist Myles Broscoe (later of Les Angles Morts, Crystal Clyffs, and AIDS Wolf), guitarist/drummer Dane Mills (later of Crackpot) and multi-instrumentalist Brendan Reed (later of Les Angles Morts and founding member of Clues), who lived with Butler and Chassagne in Montreal's Mile End neighbourhood at the time and was a collaborator with them on song-writing and arrangement (2001–2003). The initial Montreal structure of the band began to dissolve in the summer of 2002, when they travelled to Butler's family farm on Mount Desert Island, Maine to record their self-titled EP. Tension between Butler and bassist Myles Broscoe led the latter to exit the band following the recording session. Richard Reed Parry, who had been enlisted to help the band record, began to collaborate with them during the sessions and would go on to join the band shortly afterwards. Around the same time, Joshua Deu left the band to resume his studies; he continued to collaborate on the visual aspects of the band. In the winter of 2003, the band celebrated the release of its EP with a show at Montreal's Casa del Popolo. Before a crowd packed beyond capacity, the band's set ended (in the middle of an encore) with an argument between Butler and Reed, who quit the band on-stage. Mills told gathered friends in the crowd immediately thereafter that he considered the band to have broken up, as such resigning from the band as well. Following the on-stage implosion, Butler's brother William Butler (subject of the early Arcade Fire song "William Pierce Butler") and Tim Kingsbury were brought in to replace Reed and Mills so that the band could continue, and they set out to promote the self-titled EP. The eponymous release (often referred to by fans as the Us Kids Know EP) was sold at early shows. After the band achieved fame, the EP was subsequently remastered and given a full release. Howard Bilerman joined the band on drums in the summer of 2003, and they began to play shows together, and record the record that would end up becoming Funeral. The promise shown by the new band in their early live shows allowed them to land a record contract with the independent record label, Merge Records, before the end of their first year together. When asked about the rumour that the band's name refers to a fire in an arcade, Win Butler replied: "It's not a rumour, it's based on a story that someone told me. It's not an actual event, but one that I took to be real. I would say that it's probably something that the kid made up, but at the time I believed him." Funeral was released in September 2004 in Canada and February 2005 in Great Britain. The title of the debut album referred to the deaths of several relatives of band members (prominently the Butlers' grandfather, composer/arranger Alvino Rey) during its recording. These events created a somber atmosphere that influenced songs such as "Une année sans lumière" ("A Year Without Light"), "In the Backseat", and "Haïti", Chassagne's elegy to her homeland. The album was critically and commercially acclaimed. It appeared on many top ten album lists for 2004 and 2005 (due to delayed international releases), with Pitchfork, Filter, No Ripcord, and The MTV2 2005 Review crowning it the album of the year. NME named Funeral second in their list of 2005's best albums. NME also named "Rebellion (Lies)" the second best track. By November 2005, Funeral had gone gold in both Canada and the UK, and sold over half a million copies worldwide, a very large number for an independent release with minimal television or radio exposure. The album became Merge Records' first in the Billboard 200 chart and the label's biggest selling album to date, surpassing Neutral Milk Hotel's In the Aeroplane Over the Sea. The band booked small clubs for their 2004 tour, but growing interest forced many venue changes, far beyond the band's expectations, and the tour continued into mid-2005 throughout the United States, Canada, Europe, the SummerSonic Festival in Japan, and the Hillside Festival in Guelph. Taking much of the summer of 2005 off, the band made key festival appearances at the Halifax Pop Explosion, Coachella Valley Music and Arts Festival, the Sasquatch! Music Festival, Lollapalooza, Vegoose Festival, Reading and Leeds Festival in the UK, Electric Picnic in Ireland and the Lowlands Festival in the Netherlands. Arcade Fire was featured on the April 4, 2005 cover of Time's Canadian edition. On May 1, 2005, the band performed at the Coachella Valley Music & Arts Festival. In May 2005, the band signed a short-term publishing contract with EMI for Funeral, and in June the band released a new single, "Cold Wind", on Six Feet Under, Vol. 2: Everything Ends. The BBC used the track "Wake Up" on an advertisement for their autumn 2005 season, and the tracks "Rebellion (Lies)" and "Neighborhood #1 (Tunnels)" on adverts in January 2006. On September 9, 2005, the band appeared on the British/US television special "Fashion Rocks", on which David Bowie joined them for "Wake Up". This recording, as well as recordings of the band's collaboration on Bowie's "Life on Mars" and "Five Years", were made available on the iTunes Music Store in a virtual live EP. The same trip to New York City took them to the Late Show with David Letterman and a concert in Central Park. The Central Park show featured a surprise appearance by Bowie. On September 11, 2005, Arcade Fire appeared on the long-running BBC music series Top of the Pops, performing "Rebellion (Lies)". The band also performed to a TV audience in Paris for Canal+, and the show was later screened on the British television's Channel 4. The band scored two number one songs on MTV2 (UK) NME Chart Show, with "Neighborhood #3 (Power Out)" and a three-week run with "Wake Up". This success followed Rough Trade Records's last-minute decision to release "Wake Up" only on 7" vinyl. "Wake Up" was played immediately before the Irish rock group U2 started their concerts on their 2005–06 Vertigo Tour; Arcade Fire subsequently opened three shows for that tour, and at the third in Montreal, Quebec, Canada, appeared on stage during U2's encore to join in a cover of Joy Division's "Love Will Tear Us Apart". Additionally, The Dan Patrick Show, a daily national sports talk show in the US, plays the song as a lead-out every Friday to signify the end of their show. The song was also heard numerous times during the Super Bowl telecast on February 5, 2010. Funeral and the single "Cold Wind" were nominated for Grammys in the Best Alternative Rock Album and Best Song Written for a Motion Picture, Television or Other Visual Media categories (Six Feet Under, Vol. 2: Everything Ends), respectively. On April 2, 2006, in Halifax, Nova Scotia, Arcade Fire received the Juno Award for Songwriters Of The Year for three songs from Funeral: "Wake Up", "Rebellion (Lies)", and "Neighborhood #3 (Power Out)". The band was nominated for three BRIT Awards: Best International Group, Best International Album, and Best International Breakthrough Act. Arcade Fire made an appearance on the BBC show Later with Jools Holland on May 12, 2005, performing "Power Out" and "Rebellion (Lies)". On December 27, 2005, Funeral was ranked No. 1 on MTV2's "50 Greatest Albums of the Year" in the United Kingdom. On October 22, 2007, Funeral was ranked No. 8 in Bob Mersereau's book The Top 100 Canadian Albums. In late 2009, Pitchfork ranked the album No. 2 in their list of the top 200 albums of the 2000s, behind Radiohead's Kid A. During the downtime between Funeral and the beginning of recording sessions for Neon Bible, the band purchased a defunct church in the small Quebec town of Farnham, approximately 70 kilometres (43 mi) southeast of Montreal, and spent the early part of 2006 converting it into a recording studio. The first track officially released from Neon Bible was "Intervention" in December 2006 on iTunes. Proceeds from this release were dedicated to Partners in Health. An error resulted in a second song, "Black Wave/Bad Vibrations", appearing on iTunes for a short time. The album was leaked to peer-to-peer networks on January 26, 2007, and was officially released March 5, 2007 in the UK and March 6 in North America. Neon Bible premiered at number 1 on the Canadian Albums Chart and the Irish Album Charts, and number 2 on the US Billboard Top 200 charts and the UK Top 40 Album Chart for the week of March 12, 2007. The album was also number 1 on the Rock and Indie album charts. The first proper single, "Black Mirror", reached the No. 1 spot on CBC Radio 3's R3-30 chart for five consecutive weeks, from March 22 to April 19, 2007, and was the first single by any band ever to spend more than two weeks atop the chart. The album gained much critical acclaim (even being mooted as a strong contender for album of the year), and because of its success saw the band proclaimed the most exciting act on the earth by British music magazine Q. Paste voted it one of the five best albums of 2007. Trouser Press writer Jason Reeher ranked Neon Bible "among the best indie rock recordings of all time." Arcade Fire made their first appearance on Saturday Night Live on February 24, 2007 (Episode 618), performing "Intervention" and "Keep the Car Running". Owen Pallett was not present as he was recording for his solo project. During the performance, one of Win Butler's guitar strings broke, prompting him to rip the strings from his acoustic guitar and smash it on the floor until it shattered. On this guitar, "sak vide pa kanpe" was written in duct tape across the front. A Haitian proverb meaning "An empty sack cannot stand up" in Creole, this may have been a reference to the extreme poverty of Haiti, the country of origin of Régine Chassagne. On July 10, 2007, Neon Bible was named to the shortlist for the 2007 Polaris Music Prize. Patrick Watson was announced as the winner at a gala ceremony on September 24, 2007. However, due to the band's preference not to participate in compilation albums, they were the only nominee not to have a track on the Polaris promotional compilation 2007 Polaris Music Prize. Some media initially reported that the Polaris committee had snubbed the band by excluding them, leading the band and the committee to issue a joint press release confirming that the band chose not to have a track included on the album. The Neon Bible tour continued into September 2007 with 25+ dates scheduled in North America and Europe through mid-November. In Paris the band did a Take-Away Show video session shot by Vincent Moon. The band toured Australia and New Zealand for the first time in early 2008 as part of the 2008 Big Day Out festival. On October 14, 2007, Win Butler and Régine Chassagne made a surprise guest appearance at a Bruce Springsteen show in Ottawa, playing "State Trooper" and "Keep the Car Running". The band committed to give Partners in Health $1.00, £1.00, or €1.00 of every ticket sold on its 2008 European and North American tours. Arcade Fire further helped PIH, when it recorded "Lenin" on Red Hot Organization's latest album, Dark Was the Night. Sales from DWTN generated over $850,000 in money donated to AIDS related charities—$300,000 of which was given to PIH on Arcade Fire's behalf. In February 2008, Win Butler announced on the band's journal that the Neon Bible tour had come to an end, after one year of touring and a total of 122 shows (including 33 festivals) in 75 cities and 19 countries. Win Butler has been a vocal supporter of Barack Obama since the end of the New Hampshire Primary. Arcade Fire performed two free concerts for Obama in Cleveland and Nelsonville, Ohio on March 2, 2008 and March 3, 2008 before the state's March 4 primary. The band, with Superchunk, performed another two free concerts for Obama on May 1 in Greensboro, North Carolina, and on May 2 in Carrboro, North Carolina before the state's May 6 primary. On January 21, 2009, Arcade Fire and Jay-Z were the musical guests at the Obama Campaign Staff Ball at the DC Armory, at Obama's request. Butler thanked President Obama for his stated intent to close the prison at Guantanamo Bay, and repeatedly thanked the Obama staffers for their work during the election. The band was rumoured to be working with producer Markus Dravs on the soundtrack for the Richard Kelly film The Box. Win Butler denied the claims, but stated that he and Owen Pallett "may do an instrumental piece or two" for the film. In December 2008, Pitchfork reported the band set up the website miroir-noir.com to foreshadow the release of a concert film with the same title, reporting, "Miroir Noir will feature live footage from the Neon Bible tour." The upcoming film was directed by Vincent Morisset. It was made available to pre-order on December 15, 2008 with the digital version available to download immediately, and the DVD shipping March 31, 2009. A re-recorded version of the band's song "Wake Up" from their 2004 debut album, Funeral, has been used for the trailer of the Spike Jonze film Where the Wild Things Are, which was released on October 2009. The song "Wake Up" has also become popular on sports radio talk shows in the US In 2009, two nationally syndicated shows—The Dan Patrick Show and The Petros and Money Show—frequently used the song as "bumper" music. The National Football League featured this recording in commercials throughout the broadcast of the 2010 Super Bowl. The band donated the proceeds from licensing the song to the NFL to the charity Partners In Health. On May 27, 2010 it was announced that a new double-sided 12" single would be released the same day, with the full album, called The Suburbs, to be released on August 2 in the UK and on August 3 in the US and Canada thanks to Merge Records. The album is produced by Markus Dravs, who worked on previous album, 2007's Neon Bible and was engineered by Marcus Paquin, who has also previously worked with the band. A track-by-track review ahead of The Suburbs release by The Quietus website said, "The progression is similar to the one William Blake takes us through in Songs of Innocence and of Experience that suggests forward momentum and maturity." The album was released with eight different covers. The first show announced was Oxegen 2010 which took place in Ireland in July. The band announced that they would play songs from the new album in their headline performance at the Reading and Leeds Festivals in August 2010, with Win Butler noting "We're really looking forward to playing the new songs live... [it's] like an inventor emerging from his basement after a year's work." In July 2010, Arcade Fire announced they would be broadcasting their August 5 concert at Madison Square Garden live via YouTube. They later announced the video would be directed by Terry Gilliam. The Suburbs was released worldwide at the start of August 2010 to extensive critical acclaim comparable to Funeral and Neon Bible. During the 2010 tour Arcade Fire gave a tribute to Jay Reatard performing the cover of "Oh, It's Such a Shame". Win Butler confessed to Zane Lowe that the band wanted Jay Reatard to support the band on this tour, but he died. The Suburbs went on to debut at number one in the US (on the Billboard 200), selling 156,000 units in its first week. It was also number one in the UK and Canada. In August 2010, Arcade Fire and Google released an interactive music video, written and directed by Chris Milk and produced by B-Reel, which allows the viewer to enter the address where they grew up and the video is then "geopersonalised". This video utilizes the band's song "We Used to Wait" from The Suburbs, and showcases capabilities of HTML5 and Google's Chrome browser. On November 13, 2010, Arcade Fire made their second appearance on Saturday Night Live, performing "We Used to Wait" and "Sprawl II (Mountains Beyond Mountains)". In a nod to the Butlers' maternal grandfather, Alvino Rey, who was an amateur radio operator, the logo used by the band from this time was a variation of that used by the American Radio Relay League. Also, when playing the single "We Used to Wait" live, the background video screen features a radio exchange between Rey and a Canadian operator having Call Sign VE3YV. The video also features many other amateur radio artifacts. Arcade Fire performed at the 53rd Grammy Awards in February 2011. The band was nominated for Grammy Awards in three categories: Album of the Year, Best Rock Performance by a Duo or Group with Vocal, and Best Alternative Music Album (for The Suburbs). Out of the three nominations, they won the award for Album of the Year. At the 2011 BRIT Awards, The Suburbs won Best International Album, and Arcade Fire won the Award for Best International Group. In March 2011, Arcade Fire was honoured at the Juno Awards of 2011. They won Group of the Year and Songwriter of the Year for "Ready to Start", "Sprawl II (Mountains Beyond Mountains)", and "We Used to Wait", all off The Suburbs. The Suburbs also won Album of the Year and Alternative Album of the Year. On April 19, 2011 it was announced that Arcade Fire will release a deluxe edition of their album The Suburbs featuring the short film Scenes from the Suburbs, by director Spike Jonze, as well as two new tracks, "Culture War" and "Speaking in Tongues" featuring David Byrne. Scenes from the Suburbs, which debuted at the Berlin International Film Festival 2011, has a running time of 30 minutes. The film screened at the SXSW Film Festival 2011 and saw its online premiere on MUBI on June 27, 2011. Writing for the Canadian Press, Nick Patch called the film "a sci-fi puzzler that seems to blend the paranoia of Terry Gilliam films with the nostalgia of classic Steven Spielberg flicks." On June 16, the album was named as a longlisted nominee (one of 40) for the 2011 Polaris Music Prize. On July 6, the album was named as a shortlisted (one of 10) nominee for the 2011 award. On September 20, 2011, they were awarded the Polaris Prize. On May 19, 2012 Arcade Fire (minus members Will and Tim) made their third appearance on Saturday Night Live, playing as a backup band for musical guest and host Mick Jagger. The band played "The Last Time" with Jagger, and participated in Kristen Wiig's farewell skit, playing "She's a Rainbow" into "Ruby Tuesday". The band wore carrés rouges (red squares) to show support for the 2012 Quebec student protests. Arcade Fire also contributed to the movie's original score, The Hunger Games: Original Motion Picture Score. The group composed the grand, fascistic-inspired, ominous Panem national anthem, entitled "Horn of Plenty", an important and signature leitmotif appearing throughout the film. "We were interested in making music that would be more integral in the movie, just as a mental exercise," Butler, who co-wrote the song with Chassagne, explained. "And there’s an anthem that runs throughout the books, the national anthem of the fascist Capitol. So as a thought experiment, we tried to write what that might sound like. It’s like the Capitol’s idea of itself, basically." He further added that "it's not a pop song or anything. More of an anthem that could be playing at a big sporting event like the [Hunger] Games. So we did a structure for that, and then James Newton Howard made a movie-score version of it that happens in several places in the film." Arcade Fire's Panem national anthem has received strong reviews. According to Spin Mobile, "'Horn of Plenty' sounds both exactly like Arcade Fire and exactly like a futuristic anthem." Arcade Fire and Mercury Records confirmed that they would release a fourth album in late 2013. In December 2012, the band's manager Scott Rodger confirmed that Arcade Fire was in the studio working with regular producer of the band Markus Dravs and James Murphy, frontman of LCD Soundsystem. The official Arcade Fire pre-order website sets the release date on October 28, 2013. The band announced on January 18, 2013 that they were selling the church they had been using as a studio due to a collapsed roof. Throughout 2013, the band worked on the album in several different recording studios – including Murphy's DFA Records studio in New York City. On June 22, 2013, Rolling Stone reported that new material from the album would be released on September 9, 2013. On July 12, the band announced via a reply on Twitter that their new album will be released on October 29. Arcade Fire members William Butler and Owen Pallett received an Oscar nomination for Best Original score for Spike Jonze's 2013 science-fiction romance film Her. Speculation emerged in August that the album would be named Reflektor after images began circulating of street art using the name. These images were collected on an Instagram account and later uploads noted the date of September 9 and time of 9 P.M. Arcade Fire confirmed their connection to the campaign with a billboard put up in New York City on August 26, 2013. A week later, the band released a 15-second music clip on Spotify titled "9pm 9/9" under the album name Reflektor. English rock musician David Bowie contributed to backing vocals on the title song, "Reflektor" after praising the song's quality in fall 2013. Arcade Fire have recorded a version of the 1980 hit single "Games Without Frontiers" for the Peter Gabriel tribute album And I'll Scratch Yours, which was released in September 2013. Arcade Fire were the musical guest on the 39th-season premiere of Saturday Night Live on September 28, 2013. The episode drew six million viewers. They also appeared in a half hour special on NBC, Arcade Fire in Here Comes the Night Time, that aired immediately after SNL. The special featured cameo appearances by Ben Stiller, Bono, Bill Hader, Zach Galifianakis, Rainn Wilson, Aziz Ansari, Eric Wareheim, and Michael Cera. The concert footage was filmed at the band's surprise September 9 appearance at Montreal's Club Salsathèque. Arcade Fire performed live at the YouTube Music Awards on November 3, 2013. The performance featured an experimental "live video" directed by Her writer and director Spike Jonze, and actress Greta Gerwig. The band was nominated for a Satellite Award for Best Original Score for Her. They were also nominated for a Los Angeles Film Critics Association Award for Best Music Score. The band headlined the 2014 Glastonbury Festival on June 27. At the 2014 Juno Awards, Reflektor won Album of the Year and Alternative Album of the Year. The album was also a shortlisted nominee for the 2014 Polaris Music Prize. In 2015, Arcade Fire was the recipient of the International Achievement Award at the SOCAN Awards held in Montreal. A documentary film called The Reflektor Tapes, about the making of the album, was released on September 24, 2015 and was shown at the 2015 Toronto Film Festival. The following day, a deluxe edition of the album containing original recordings and five unreleased songs was released. The documentary was directed by Kahlil Joseph, winner of the 2013 Sundance Grand Jury Prize for Short Films. On May 25, 2016, Win Butler and Régine Chassagne performed a surprise set outside the Louvre which included a new song. The pair were invited by the French street artist JR to DJ at the launch of his new exhibition titled JR Au Louvre, but set up drums and keyboards in the Tuileries gardens. On June 17, Will Butler hosted a Reddit AMA, where he answered fan questions about the next Arcade Fire album. He stated that the new record may be released in spring 2017 and that the band had 'no definite schedule though. It'll be done when it's done.' On July 5, the band played their first complete full-band concert in two years in Barcelona, Spain as a warm up for their upcoming summer festival dates in Canada, Portugal, Spain and USA. On July 19, Tim Kingsbury told CBC that the band's upcoming fifth album would be out in 2017. On January 19, 2017, the band released a new single to coincide with Donald Trump's presidential inauguration entitled "I Give You Power". The song featured guest vocals from singer Mavis Staples. The proceeds were donated to the American Civil Liberties Union. Arcade Fire signed a two album recording contract with Columbia Records in May 2017. On May 31, the band released a new single "Everything Now" on a limited edition 12" vinyl at the Primavera Sound Festival in Barcelona. Arcade Fire would also perform at the festival in early June 2017. A day later, Arcade Fire announced their fifth studio album Everything Now, which was released on July 28, 2017, and released a music video for "Everything Now". In July 2017, "Everything Now" became Arcade Fire's first single to reach number one on a Billboard chart, reaching number one on the Adult Alternative Songs airplay chart. In October 2017, long-time manager Scott Rodger parted ways with the band. After releasing two teasers on their social media pages a few days before, on March 12, 2018, the band announced a short film, directed by David Wilson called "Money + Love", containing two of their songs "Put Your Money On Me" and "We Don't Deserve Love", and being released on March 15. On March 17, Arcade Fire were featured as the musical guest on Saturday Night Live for a fifth time, performing "Creature Comfort" and "Put Your Money On Me". Because Régine Chassagne is of Haitian descent, Arcade Fire continuously works to support Haitian people through raising awareness of the struggles this country currently faces, as well as the history, specifically the regime of François Duvalier in which 30,000 to 60,000 Haitians were murdered. This time in history is highlighted in Arcade Fire's song "Haiti". Chassagne co-founded the Kanpe (Creole for "to stand up"), a foundation that "brings together Haitians, members of the diaspora, friends of Haiti, and partners on the ground to develop customized solutions to enable these families to escape the cycle of poverty and stand on their own." 2004: Arcade Fire played two shows in the hometown of Haiti where all profits were donated to Albert Schweitzer's hospital in Haiti. 2005–present: Arcade Fire has donated $1.00, £1.00, or €1.00 of every ticket sold on tour to Partners in Health + Kanpe, via Plus1. 2006: Proceeds from the release of track "Intervention" were dedicated to Partners in Health. 2009: Arcade Fire recorded "Lenin" for Red Hot Organization's "Dark Was the Night". $850,000 raised for AIDS relief; $300,000 was donated to Partners in Health. 2010: The NFL purchased rights to "Wake Up" for Super Bowl XLIV; all proceeds went to Partners in Health. AF ♥ Haiti campaign: trained 50k+ volunteers to engage fans in Partners in Health's mission. For a more comprehensive list, see Arcade Fire discography. ^ a b c Kim, Michelle (May 31, 2017). "Arcade Fire Sign to Columbia". PItchfork. Retrieved May 31, 2017. ^ "Arcade Fire: Art-Rock Fueled by Eclecticism and Pain". NPR. June 4, 2007. Retrieved October 12, 2016. ^ Feldberg, Isaac (July 27, 2017). "An overload from Arcade Fire". The Boston Globe. Retrieved July 28, 2017. ^ Schonfeld, Zach (July 28, 2017). "Arcade Fire 'Everything Now' Review: A Disco-Tinted Mess of an Album". Newsweek. Retrieved July 30, 2017. ^ Ugwu, Reggie (October 3, 2013). "Arcade Fire's 'Reflektor': What We Learned From An Early Listen". Billboard. Retrieved March 21, 2018. ^ Madeline (November 13, 2010). "The Ultraviolet". The Ultraviolet. Marlboro High School. Retrieved February 8, 2015. ^ "Arts and media | About McGill – McGill University". Mcgill.ca. Retrieved May 9, 2017. ^ "Arcade Fire’s maternal spark", Portland Press Herald, Portland, ME, 26 January 2014. Retrieved on 9 April 2015. ^ "Timeline: Arcade Fire burning bright". Global News. Retrieved July 18, 2017. ^ Rayner, Ben (March 6, 2007). "Arcade Fire still burning". Toronto Star. Toronto. Retrieved April 28, 2008. ^ Byrne, David (December 18, 2007). "David Byrne's Survival Strategies for Emerging Artists – and Megastars". Wired. Retrieved April 28, 2008. ^ Hoard, Christian (February 24, 2005). "The Fire This Time". Rolling Stone. Retrieved April 28, 2008. ^ Sinagra, Laura (September 9, 2005). "The Listings: Sept. 9 – Sept. 15; ARCADE FIRE". The New York Times. Retrieved April 28, 2008. ^ Dickson, Andrew (December 2, 2005). "NME defends album of year poll". The Guardian. London. Retrieved April 26, 2008. ^ "Exclusive – Arcade Fire duet with Bowie released". NME. November 8, 2005. Retrieved April 26, 2008. ^ Kot, Greg (May 8, 2005). "Pitchfork e-zine tells indie fans what's hot and not". Honolulu Advertiser. Archived from the original on April 21, 2008. Retrieved April 26, 2008. ^ "On the Beat: David Menconi on music". The News & Observer. February 22, 2007. Archived from the original on August 23, 2007. Retrieved April 28, 2008. ^ Batman, Joseph W. (March 19, 2007). "Spreading Like an 'Arcade Fire'". Salt Lake Community College. Retrieved April 28, 2008. ^ "Episodes: Arcade Fire". PBS. Retrieved July 17, 2008. ^ "Arcade Fire invited for U2 tour support". NME. Retrieved July 17, 2008. ^ "Songwriter Of The Year (sponsored by SOCAN)". Juno Awards. Archived from the original on April 27, 2006. Retrieved April 26, 2008. ^ "Arcade Fire, Feist, Buble earn Brit Award nods". Toronto Star. January 14, 2008. Retrieved July 17, 2008. ^ "The "Top 100" Canadian Albums of "All Time"". Bumper Shine. October 22, 2007. Retrieved April 26, 2008. ^ "Pitchfork: Staff Lists: The top 200 albums of 2000s". Pitchfork.com. Retrieved October 28, 2013. ^ a b "Intervention On iTunes + Partners In Health Charity". Arcade Fire. Archived from the original on July 24, 2009. Retrieved April 28, 2008. ^ "Arcade Fire's Neon Bible Debuts at No. 2". Billboard. Archived from the original on January 18, 2010. Retrieved January 20, 2010. ^ "Arcade Fire EP (Can. self-released) 2003 (Merge) 2005". Trouser Press. Retrieved July 17, 2008. ^ "SNL Archives Episodes". SNL Archives. February 24, 2007. Archived from the original on April 24, 2008. Retrieved April 28, 2008. ^ "Singing for the Poor in Haiti: The Arcade Fire and Partners in Health". Indy Bay. Retrieved July 17, 2008. ^ "Arcade Fire, Feist on Polaris short list". Canada: CBC. July 10, 2007. Archived from the original on April 16, 2008. Retrieved April 28, 2008. ^ "Feist, Fire get Polaris noms". Canadian Online Explorer. Archived from the original on December 24, 2007. Retrieved April 28, 2008. ^ Love, Noah (July 10, 2007). "Arcade Fire, Feist And The Dears Among Polaris Nominees". Chart. Archived from the original on December 21, 2008. Retrieved November 20, 2008. ^ "Joint Statement by Arcade Fire and the Polaris Music Prize" (PDF). Polaris Music Prize. Archived from the original (PDF) on April 14, 2008. Retrieved April 28, 2008. ^ "Arcade Fire – Arcade Fire – La blogothèque". Blogotheque.net. Archived from the original on July 26, 2010. Retrieved July 27, 2010. ^ "Brucebase 2007". Brucebase Wiki. Retrieved April 28, 2008. ^ "Arcade Fire sparks support for PIH – Canadian band raises issues and funds". Partners In Health. Archived from the original on January 16, 2010. Retrieved April 28, 2008. ^ "Neon Bible Tour Is Over". Arcade Fire. Archived from the original on July 24, 2009. Retrieved July 17, 2008. ^ "Arcade Fire's Win Butler Disses Hillary, Backs Obama". Pitchfork. Archived from the original on May 7, 2008. Retrieved April 28, 2008. ^ "Arcade Fire to perform for Obama in Ohio". CNN. Archived from the original on April 13, 2010. Retrieved April 25, 2010. ^ "A hall for all". The Columbus Dispatch. Retrieved May 9, 2010. ^ Nagourney, Adam (March 2, 2008). "Spending Heavily, Obama Attempts Knockout Blow". The New York Times. Retrieved July 17, 2008. ^ "Arcade Fire Scoring Donnie Darko Dude's New Movie". Pitchfork. Archived from the original on May 13, 2008. Retrieved May 14, 2008. ^ "Arcade Fire Not Scoring The Box, Enjoying Wolf Parade". Stereogum. Archived from the original on May 19, 2008. Retrieved May 20, 2008. ^ "Arcade Fire to Release Film, Possibly Live Document". Pitchforkmedia.com. Retrieved October 28, 2013. ^ "Arcade Fire to release 'Miroir Noir' documentary on Monday (Dec 15) | News". NME. December 12, 2008. Retrieved July 27, 2010. ^ "Arcade Fire – Neon Bible Archives – Video – DVD". Miroir Noir. Retrieved July 27, 2010. ^ Montgomery, James (March 26, 2009). "Arcade Fire Re-Record 'Wake Up' For 'Where The Wild Things Are' Trailer". MTV. Archived from the original on March 29, 2009. Retrieved April 6, 2009. ^ a b "Arcade Fire License "Wake Up" to Super Bowl to Benefit Haiti Relief". Pitchfork.com. Retrieved October 28, 2013. ^ "Arcade Fire". Arcadefire.com. Retrieved October 28, 2013. ^ "Dravs aids Arcade Fire". Pitchfork. Archived from the original on December 5, 2009. Retrieved December 1, 2009. ^ "Arcade Fire The Suburbs Track-By-Track Review". The Quietus. July 21, 2010. Archived from the original on July 24, 2010. Retrieved July 21, 2010. ^ "Arcade Fire the suburbs synchronised artwork, traditional artwork & minimalis interactive stuff". Archived from the original on November 12, 2010. Retrieved October 30, 2010. ^ "Arcade Fire announce European festival appearance | News". Nme.Com. March 8, 2010. Retrieved October 28, 2013. ^ "Arcade Fire Set To Debut Songs From Upcoming Album". Archived from the original on April 3, 2010. ^ "Arcade Fire Webcast To Be Directed By Terry Gilliam". Exclaim.ca. 2010. Retrieved July 5, 2010. ^ "The Suburbs reviews at". Metacritic.com. July 26, 2010. Archived from the original on July 28, 2010. Retrieved August 6, 2010. ^ "Arcade Fire on "Saturday Night Live"". Pitchfork. November 14, 2010. Retrieved February 21, 2011. ^ The Gazette (January 13, 2011). Arcade Fire to perform at Grammys Archived January 16, 2011, at the Wayback Machine. Canada.com. Retrieved on 2011-01-21. ^ Duke, Alan (February 14, 2011). "Grammy upset: Arcade Fire beats Gaga, Eminem for top album". CNN. Archived from the original on February 14, 2011. Retrieved February 15, 2011. ^ Kot, Greg (February 13, 2011). "Turn It Up: Grammy Awards 2011: Arcade Fire wins album of the year". Chicago Tribune. Archived from the original on February 17, 2011. Retrieved February 15, 2011. ^ Estes, Adam Clark (February 13, 2011). "UPDATED: 2011 Grammys Winners and Losers". Salon. Retrieved February 15, 2011. ^ "Arcade Fire's Week Gets Even Better After Winning Brit Awards". TIME. February 17, 2011. Archived from the original on February 22, 2011. Retrieved February 21, 2011. ^ "32 Juno Award Winners Are CROWNED! Canada's Music Elite GAather To Celebrate 40 Years Of The Juno Awards". JUNO Awards. March 26, 2011. Archived from the original on August 11, 2011. ^ Cragg, Michael (May 24, 2011). "Arcade Fire feat David Byrne – Speaking in Tongues". The Guardian. London. ^ Richardson, Mark (November 18, 2010). "Watch: Video for Arcade Fire's "The Suburbs"". Pitchfork. Archived from the original on November 27, 2010. Retrieved November 18, 2010. ^ "Scenes from the Suburbs – Movie info: cast, reviews, trailer on". Mubi.com. Retrieved October 28, 2013. ^ Ashley Carter (June 16, 2011). "2011 Polaris Music Prize Long List announced". Aux.tv. Archived from the original on October 2, 2015. Retrieved October 28, 2013. ^ Brophy, Aaron (May 20, 2012). "Arcade Fire Support Quebec Student Protests on Saturday Night Live, Join Likes of Michael Moore, Anonymous". Spinner.com. ^ a b "Weekly Chart Notes: 'Hunger Games,' Taylor Swift, Adele – Chart Beat". Billboard. Retrieved May 1, 2012. ^ Sinha, Piya (March 28, 2012). "The Hunger Games soundtrack tops Billboard chart". The Vancouver Sun. Retrieved May 1, 2012. ^ a b c "Arcade Fire Created the National Anthem of Panem! – Hunger Games". Hungergamesmovie.org. March 2, 2012. Archived from the original on May 5, 2012. Retrieved May 1, 2012. ^ a b c "Arcade Fire – "Horn Of Plenty"". Stereogum. March 24, 2012. Retrieved May 1, 2012. ^ "SPIN Mobile – News – Arcade Fire Drop Dystopian 'Hunger Games' Anthem 'Horn of Plenty'". M.spin.com. March 26, 2012. Archived from the original on June 10, 2012. Retrieved May 1, 2012. ^ a b "Report: New Arcade Fire Release Date Emerges | Music News". Rolling Stone. June 22, 2013. Retrieved October 28, 2013. ^ Kreps, Daniel (October 25, 2012). "New Arcade Fire Album Likely Ready By Late 2013". Spin Magazine. Retrieved October 29, 2012. ^ "Arcade Fire are in studio with James Murphy, confirms manager". NME Magazine. December 7, 2012. Retrieved December 7, 2012. ^ Young, Alex (January 18, 2013). "Buy Arcade Fire's church". Consequence of Sound. Retrieved January 18, 2013. ^ "Arcade Fire Announce New Album Release Date | News". Pitchfork. July 12, 2013. Retrieved October 28, 2013. ^ Pelly, Jenn (August 7, 2013). "Arcade Fire Score Spike Jonze Film Her". Pitchfork. Retrieved August 8, 2013. ^ "Mysterious 'Reflektor' campaign, thought to be Arcade Fire related, teases September 9 reveal". NME. August 13, 2013. Retrieved August 26, 2013. ^ McGovern, Kyle (August 26, 2013). "Arcade Fire's 'Reflektor' Mural Points To September Surprise". Spin. Retrieved August 26, 2013. ^ Tucker, Rebecca (August 26, 2013). "Arcade Fire confirm mysterious online 'Reflektor' campaign is their doing; something Arcade Fire-related will happen on Sept. 9". National Post. Retrieved August 26, 2013. ^ "Arcade Fire release snippet of new music on Spotify – listen". NME. September 2, 2013. Retrieved September 2, 2013. ^ "David Bowie Sang on Arcade Fire's 'Reflektor'". Rolling Stone. Retrieved July 28, 2017. ^ "Arcade Fire cover Peter Gabriel's 'Games Without Frontiers' – listen". NME. July 26, 2013. Retrieved August 28, 2013. ^ "'SNL' Season Debut Best In 3 Years Demo-Wise And 2 Years Overall". Deadline.com. Retrieved October 28, 2013. ^ Guthrie, Marisa (September 9, 2013). "Tina Fey to Open 39th Season of 'Saturday Night Live'". Hollywood Reporter. Retrieved September 10, 2013. ^ Lipshutz, Jason. "YouTube Music Awards: Eminem, Arcade Fire, Lady Gaga Highlight Gleefully Messy Show". Billboard. Retrieved November 4, 2013. ^ "2013 Nominations". International Press Academy. Retrieved December 4, 2013. ^ "Next year, one week in June". Arcade Fire. Retrieved December 19, 2013. ^ "Arcade Fire to headline Friday at Glastonbury 2014". Music Blogged. December 19, 2013. Retrieved December 20, 2013. ^ "2015 SOCAN Awards – SOCAN". Socan.ca. Retrieved July 28, 2017. ^ "Toronto Film Festival Adds 60+ Titles". IndieWire. Retrieved August 11, 2015. ^ "Arcade Fire presents The Reflektor Tapes". Arcade Fire presents The Reflektor Tapes. Retrieved October 4, 2015. ^ "Watch Arcade Fire's Surprise Performance Outside the Louvre". Pitchfork. May 27, 2016. Retrieved July 8, 2016. ^ "Watch Arcade Fire perform surprise open-air show in Paris". NME. May 27, 2016. Retrieved July 8, 2016. ^ "Arcade Fire's New Album Out "Probably Next Spring"". Pitchfork. June 17, 2016. Retrieved July 8, 2016. ^ "Arcade Fire hit the stage for first concert in two years at Barcelona's Razzmatazz: Setlist + Video". Consequence of Sound. July 6, 2016. Retrieved July 8, 2016. ^ Dekel, Jonathan (July 17, 2016). "New Arcade Fire album coming 'next year'". CBC Music. CBC. ^ Young, Alex; Geslani, Michelle (January 19, 2017). "Arcade Fire make their glorious return with "I Give You Power" — listen". Consequence of Sound. Retrieved January 21, 2017. ^ "Reflektor – Photo Gallery: Arcade Fire at Festival BUE in..." Reflektor. Retrieved June 6, 2018. ^ a b Halperin, Shirley (May 31, 2017). "Arcade Fire Signs with Columbia Records". Variety. Retrieved May 31, 2017. ^ Monroe, Jazz (June 1, 2017). "Arcade Fire Announce New Album Everything Now". Pitchfork. Retrieved June 2, 2017. ^ "Arcade Fire Earns First No. 1 Song With 'Everything Now'". Billboard.com. Retrieved July 28, 2017. ^ Hu, Cherie (October 24, 2017). "Arcade Fire & Maverick Management's Scott Rodger Part Ways After 13 Years". Billboard. Retrieved October 25, 2017. ^ "Arcade Fire on Instagram: "Money + Love Coming soon."". Instagram. Retrieved March 13, 2018. ^ "Arcade Fire". www.facebook.com. Retrieved March 13, 2018. ^ "Arcade Fire on Instagram: "Money + Love Coming March 15th"". Instagram. Retrieved March 13, 2018. ^ "Watch the Trailer for Arcade Fire's New Video "Money + Love" | Pitchfork". pitchfork.com. Retrieved March 13, 2018. ^ Young, Alex (March 18, 2018). "Arcade Fire perform Everything Now songs, poke fun at Canada on SNL: Watch". Consequence of Sound. Retrieved April 8, 2018. ^ "What is KANPE". kanpe.org. Retrieved October 20, 2016. ^ Light, Alan (January 1, 2011). "Arcade Fire's Band Aid for Haiti". Mother Jones. Retrieved October 18, 2016. ^ "Régine Chassagne – KANPE Co-Founder". kanpe.org. Retrieved October 20, 2016. ^ "Partners In Health ♥ Arcade Fire". Pih.org. Retrieved October 20, 2016. ^ Frey, Darcy (March 4, 2007). "One Very, Very Indie Band". The New York Times. Retrieved July 17, 2008. ^ "Arcade Fire: Art-Rock Fueled by Eclecticism and Pain". NPR. Retrieved July 17, 2008. 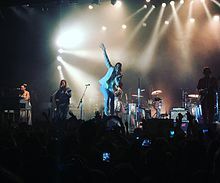 Wikimedia Commons has media related to Arcade Fire.